It’s days like these where I sincerely miss living in Louisiana. As I watch all of my facebook friends post pictures of parades and how they are enjoying king cakes, you can’t help but get a little home-sick. Years ago, my husband and I used to have an annual Mardi Gras party at our home. 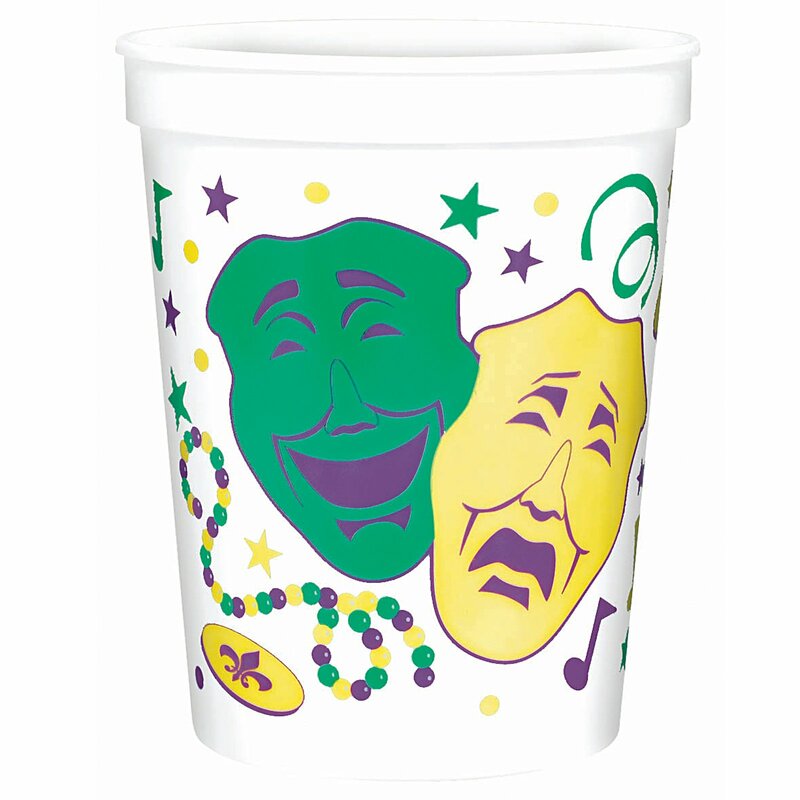 I would bake a few king cakes (trust me, it’s difficult and pricey to find a decent king cake in Georgia), make a huge chicken & sausage gumbo, ship in some beads and Mardi Gras cups and we’d throw a nice party for our friends in the area. Each year it grew and then my sister (who lives in Kansas City) started hosting one as well. They had hurricanes at their party one year, so we thought “Great idea, let’s mix up a few gallons of hurricanes!” Well, that was fun, but also enabled things to get out of hand pretty quickly. We had freezing ice on the deck and kids all over the living room. One child even barricaded himself in the downstairs bathroom, removed all of his clothes and refused to come out. It was a riot, but our house was trashed and I felt like it was getting out of hand. It was becoming un-manageable, so we stopped hosting the party. I still bake king cakes every year – I think of it as a consolation prize for those who would come to the party (if we still had it), but less mess and less work for me. Oh, and my house doesn’t get trashed in the process. We literally had king cake stomped into the carpet by the end of the night last time we hosted the party. This year, I just happened to make my king cakes on the same day that someone in the office was returning from a trip to Lafayette (of all places!) and brought one back to share with employees in his department. 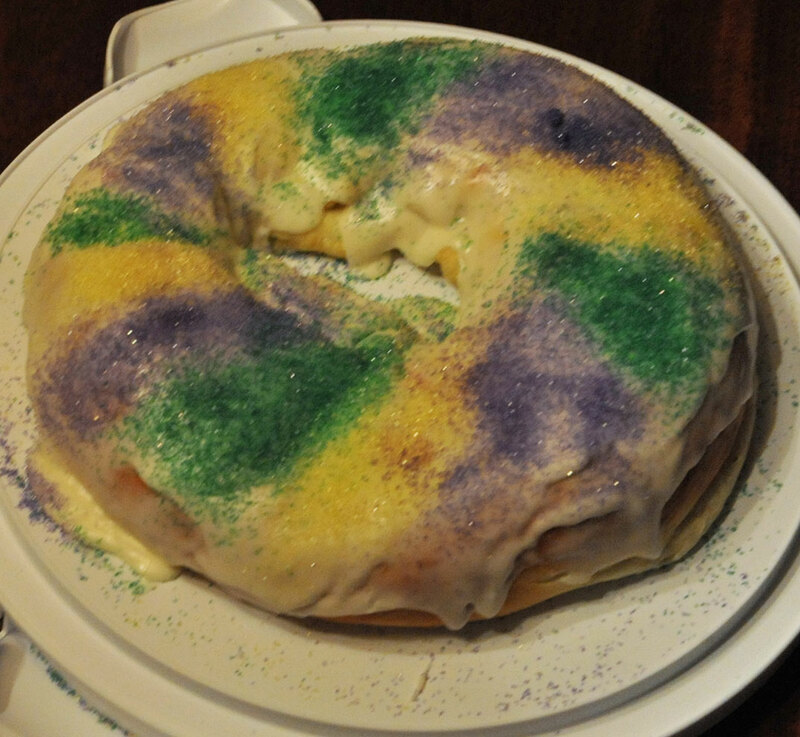 When I found out about this Lafayette king cake, I demanded a taste test with my home-baked version vs the store bought one from Lafayette (actually, it was purchased at a coffee shop, but they are still mass-produced). Here are some shots of my cake vs. the store bought one. I am proud to say that my homemade cake won hands down. If you’re an exiled Cajun (like me) and would like to try baking your own, here are a few recipes to start with – I should warn you that you should be comfortable working with yeast and baking bread before attempting the recipes (just my two cents). My favorite is a combination of a few of them (see my notes below). The Steen’s Syrup filling from this recipe is delicious! Emeril’s recipe – I made this once and thought it was too much work. My sister and I also made up a filling where we take an 8-oz brick of cream cheese, about 1.5 cups of powdered sugar and a 1/2 tsp of almond flavoring and beat that in a mixer. Use that as a filling for one of the cakes above and you’ll have a tasty filling. For the topping, I make up one of the icing/glaze recipes from one of the king cake recipes above, then get some colored “Sanding Sugar” from Williams-Sonoma in purple, green & gold to sprinkle on top. It’s so easy and worth the money you pay instead of having to make your own. 3 Responses to Happy Mardi Gras!